There are some good Koh Phi Phi discounts to be had if you know the right place to look and the right time to travel. Phi Phi is 45 km from the mainland and has no mainland electricity (2012) and so prices tend to be higher than on the Phuket, Samui and Krabi beaches. This ensures finding a discount is of key interest to many. During the high season and for 40 % of low season, the island can be full (only 3,500 rooms on the island) so Koh Phi Phi discounts are difficult to spot. On top of this, the bottom 25 % of the rooms available do not have fixed or set prices and let the room rates go up and down depending on how full the island is. The only way to beat this is to book ahead. This way you can get the best reviewed rooms in the best reviewed resorts and ensure their price. One quick extra point. During the Full Moon Party many travellers head over to Koh Phangan and if Phi Phi island was full before, it will become quieter. This is a good time to travel to the island as it is quieter and can potentially be cheaper. The best place to find Koh Phi Phi discount is on the Phi Phi Hotel Deals page. Here you will find any Free Night Specials, Fixed Night Promotions, Special Discounts, Early Bird Offers and Honeymoon offers. The Zeavola Phi Phi Resort, Holiday Inn Phi Phi Island, Phi Phi Island Village Resort And Spa and Phi Phi Island Cabana Hotel often compete with each other to offer the best deal to ensure the resort stays full so will often have something available at a good deal. Although not strictly a discount, the entry level room in a luxury resort will have the same room decor, hotel facilities and service as the finest suite so good prices can be found considering the starter room. There are many beachfront resorts as most of the island is mountainous so all the accommodation has been built on the edge of the island. The main Koh Phi Phi discount to consider come with the seasons as low season, (May till October 31st) is 40% cheaper than high season and can be as much as 70% cheaper than peak season 20th December to 20th January. See Koh Phi Phi weather to work out which low season months can have high season like weather. Popular resorts are the Mama Beach Residence in the main village and the Phi Phi The Beach Resort and Phi Phi Relax Beach Resort on the quieter beaches. Like I said above there can be good Koh Phi Phi discountguesthouses in low season and during the full moon party but the ones with the best reputation get filled online. Phi Phi Viewpoint resort offers striking views across the Loh Dalum bay along with Dee Beach resort and on the Tonsai Bay side the Sand Sea Resort and Popular resort have great beachfront positions. The other way to get a good discount is to hunt out the rooms that allow you to sleep 3,4 or 5 to a room. Travelling as a group of friends or as a family will make these room types come in heavily discounted per person. The Tohko Beach Resort has the Family Bungalow Beach Front and Family Bungalow Beach Front Air-con room types which can give you a beachfront resort for 300 THB per person a night. 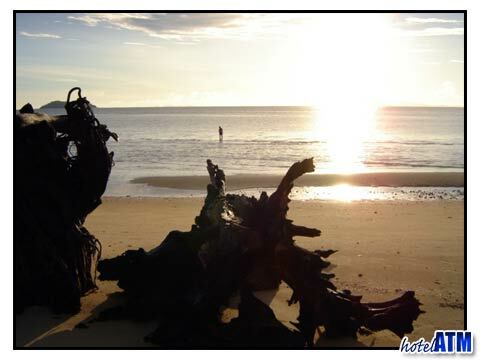 The Andaman Beach Resort has 3, 4 and 5 per person rooms and is popular place to stay in the main village. The Bamboo Mountain View has 3 and 4 sharing though has average reviews as of 2012. Harmony House has 3 and 4 sharing rooms. The more upmarket Phi Phi Paradise Pearl has 3 sharing rooms right on the famous Phi Phi Long beach which is just 5 minutes from the main village. 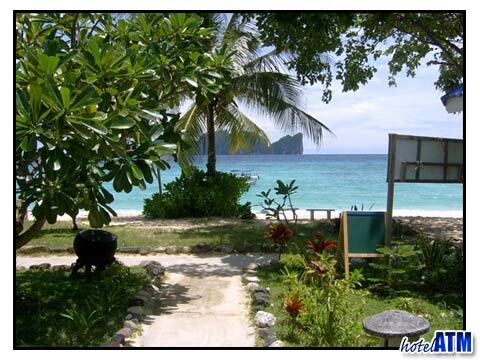 This popular and comfortable resort also gives stunning views of Phi Phi Ley and a pretty coral reef.